Akwaaba! Welcome to Ghana! Our tour guide will meet you at Kotaka International Airport of Accra. From Accra we continue to Aburi beautifully set in the Akwapim Mountains. During a welcome meeting your guide will provide you with useful information about your stay in West Africa and you will be given details of the itinerary. Situated at an altitude of about 450 m Aburi is a relatively cool and breezy town and formerly served the British as a hill station. Due to its healthy climate it is a popular goal for Accra’s stressed inhabitants coming here for a day trip to relax. Aburi’s main attraction is the famous Botanical Garden. Founded by Britain in 1890 this park is a Garden Eden for those who look for a peaceful hang-out as well as for the botanically interested and it is the ideal place to start our 17-days tour. We do not only find indigenous plants from Ghana but also many exotic trees imported from Asia, South America and other parts of Africa. We enter the 65 ha covering garden walking along an avenue of tall, svelte palm trees which leads us directly to a lawn where a tropical giant is growing into the sky: a 150-year-old silk cotton tree, the only survivor of the original forest. Next to it there is a huge bamboo from China and a strangely shaped Hosana palm from South Africa. Nearby we discover an amazing mystery of nature: for 30 years a persistent strangler fig has enveloped and finally killed its impressive host tree, Afzelia Africana. All plants are carefully labelled with their names and an experienced botanist will guide us on our tour. We continue our day excursion to Akosombo. A few kilometres from Aburi we reach the small town of Mampong where we visit the Tetteh Quarshis’s farm. In 1876 he brought the first cocoa seedlings to Ghana from the island of Fernando Po. What was first a simple experimentation to determine if the foreign trees could grow in Ghana turned out to be a great success: the exotic beans became the most important cultural plant of Ghana and alongside with gold developed to be the top export product. During our visit we see some more than 100-year-old original trees planted by Tetteh Quarshie. An employee of the farm will show us round and explain how cocoa is planted and picked. By lunch time we arrive at Akosombo. After a refreshing snack we’ll take a look at the impressive 670-meter-long and 135-meter-high Akosombo Dam wall. The Volta River, with 1600 kilometres Ghana’s longest river,was dammed at Akosombo for hydropower generation. The resulting Lake Volta covering an area of 8500 km² has the largest surface area of any manmade lake in the world. It is Ghana’s lifeblood as it provides drinking water and electricity and due to this engineering marvel some industries have developed. On the other side of the dam the Volta River flows slowly to the sea. Here we take a one-hour boat-ride in a scenic area where the forested Akwamu Mountains rise up from the river banks. Towards evening we return to Aburi. This morning a one-hour drive takes us to Accra. We visit the two-million metropolis situated on the Gulf of Guinea. Accra was founded in the 15th century when the Ga tribe who lived in this area started to trade with passing Portuguese ships. When the profitable slave business started it took not long that other Europeans appeared on the scene. The Dutch, Swedes, Danes and Britons built massive fortresses in the area of today’s Accra and its surroundings. In 1650 the Dutch and later British Ussher Fort was constructed, in 1657 the Swedish started to erect Christiansborg Castle which finally has been completed by the Danish and in 1663 the British James Fort was built. All three monuments still exist today but only Ussher Fort is open to the public. Christiansborg is the seat of government and cannot even be approached closely and James Fort now serves as a prison. We begin our exploration at Independence Square which is dominated by the impressive Independence Arch with a black star on the top symbolising freedom and justice. The huge monument was erected on the occasion of Ghana’s independence in 1957 and is placed next to a big parade ground intended to hold 30.000 people. From Independence Square we continue to the Kwame Nkrumah Mausoleum. Inaugurated in 1992 Ghana’s first president’s tomb is set in a beautiful park. From there we drive along High Street, passing the old parliament, Holy Spirit Cathedral and the huge walls of Ussher and James Fort until we reach James Town, the old part of Accra. James Town is arguably the most atmospheric quarter of Accra: many colonial-era buildings and colourful markets characterise the townscape and the old fishing harbour is very busy in the morning. We’ll see the 30m lighthouse, the quarter’s landmark. Later today you’ll have time to visit the National Museum. The exhibits include some excellent examples of traditional crafts ranging from a whole array of Kente textiles, carved stools, musical instruments and masks to archaeological artefacts and displays. We leave Ghana’s vibrant capital in the afternoon heading Anomabo where we spend the night in a beautiful resort situated on a palm-lined beach. After taking breakfast at our hotel we continue our journey to Elmina. Elmina is a town of about 25.000 inhabitants situated in the Edina Bay. It started life as a fishing village about 700 years ago and became the first place in Ghana which was occupied by the Europeans. In 1471 the Portuguese arrived at the village and entered into trade with the local people. They wanted to safeguard their original interest in the lucrative gold and ivory trade, so in 1482/3 they laid the foundation of two impressive castles as their foothold on the Gulf of Guinea: Sao Jorge da Mina und Sao Jago da Mina. At the beginning these buildings were used as a trading post and supply station for passing ships, but after the discovery of the Americas things changed and in subsequent centuries it was mostly used for the slave trade. In 1637 Sao Jorge da Mina, known today as Elmina Castle, was conquered and extended by the Dutch. In the morning we visit Elmina Castle. Along with Cape Coast Castle and Fort St. Jago, Elmina Castle was recognized by UNESCO as a World Heritage Site in 1972. We enter the courtyard of this impressive fortress via a drawbridge over a moat. The first thing we see is a cell with a skull and crossbones drawn on top of the entrance door, to warn recalcitrant slaves. Our guide will tell us later that all slaves kept here were condemned to death. We start our tour visiting the grim dungeons where men and women were kept separately. We learn more about the appalling Gate of no Return, a small opening in the wall through which the slaves were taken and transferred to the ships which brought them irrevocably away from the land of their ancestors. On the upper floors there are the rooms of the officers, the kitchen and the governor’s apartment. In Elmina Castle, too, there are still threatening canons pointing to the sea. The rest of the day you have free time. You may want to linger awhile at the town’s picturesque fishing harbour, situated in front of the castle where the Benya River meets the sea. The harbour is laden with hundreds of colourful wooden boats decorated with beautiful flags. From a bridge over the river you can enjoy a stunning view of the busy life in the harbour. Every morning, when the fishermen come back from the sea, a crowd of people stands on the bridge to welcome them. The catch of the day is unloaded immediately to be sold. Elmina is real fireworks for the senses! Shouting and gesticulating salesmen, pirogues painted in bright colours, the penetrating smell of fish! With the salty taste of the rough ocean on your tongue you make your way through the crowded streets throng of people. Women ably balance huge bowls of barracuda, sardines or shrimps on their heads to bring them to the nearby fishing market. Workers are busy sawing and hammering at the shipyard on the lagoon. Located on a hill facing Elmina Castle and the sea, São Jago da Mina, the Dutch Conraadsburg, rises high above the town. Enjoy a magnificent view over the vibrant harbour, the breaking waves of the ocean and the proud Elmina Castle. You also have some time to relax today and spend the afternoon on the palm-fringed beach of the beautiful bay. Today we visit another highlight of our trip: Kakum National Park situated only 45 km away from Cape Elmina. Founded in 1990, this nature reserve, covering an area of 350 km, boasts an excellent tourist infrastructure. Kakum is home to a diversity of plants, trees and animals and protects at least 40 mammal species including the extremely rare forest elephant, forest buffalo, bongo and giant forest hog. 266 bird species are reported, eight of them of global conservation concern (including white-breasted guinea-fowl and brown-cheeked hornbill). There is a special adventure waiting for us: a canopy walk some 40 m high (optional). Seven narrow bridges are suspended between seven huge trees offering breath-taking views of the lush forest at the canopy level. There are platforms where we can linger and soak up the beautiful nature. However it is a bit of a wobbly affair, but don’t be afraid: the 350-m-long walkway is well-secured and we are accompanied by an experienced guide. For those with a poor head for heights there is a good alternative. You can take a guided nature walk to see the fascinating rain forest and learn more about the tropical plants and trees and their use in traditional medicine. For lunch we stop at Cape Coast. Next to the castle there is a popular restaurant serving excellent fish and sea food or meat dishes. After lunch we visit Cape Coast which is situated about 170 km from Accra. It is steeped in history and already existed as a tiny fishing village before the first Europeans arrived. Until 1876 it was the capital of the British Gold Coast colony. Today Cape Coast is still the main town of the Central Region and has developed to a centre of education. The majestic Cape Coast Castle rises above the deep blue ocean. After the foundation was laid there was a hot competition among the European nations before Britain gained the control during the Anglo-Dutch War in 1664-65. The British made it their headquarters on the Gulf of Guinea and later the first seat of government of Britain’s Gold Coast colony and residence of their governor. Cape Coast became one of the most important trading harbours of those days due to its special location at the crossroads of the European maritime trading routes and the trans-Saharan caravan routes. Gold, ivory, spices and coffee were exchanged for ammunition, arms, tobacco, rum and metal objects. But soon the most important “ware” became the human being. Cape Coast developed to a main trading centre for slaves and the sublime castle played a sad role in it. The facts presented to us during our visit are utterly shocking: during the time of slave trade an estimated number of 60 million people were shipped mainly to the New World, only a third of them are supposed to have arrived at the American shore. In chains men, women and children were packed in the ship’s dark hull. Before they were transported to the vessels anchoring in the sea they were held in dungeons, hundreds of them were kept in one small room under inhumane conditions: no light, no clothes, no fresh air and not enough food and water. The captives’ terrible fate is shown in a museum which we visit before we start our tour through the dungeons and the governor’s rooms. In the courtyard we see several tombs, governor MacLean and his wife Leticia Landon are buried here as well as Philip Kwakwe, the first Anglican priest of African origin at Cape Coast. A big number of cannons are still pointing threateningly to the sea. With a lot of new impressions we leave the fortress heading back to Elmina. We continue our journey saying good-bye to the Atlantic Ocean and heading inland to the heart of Ghana, the Ashanti Region. We drive through tropical rain forest and authentic small villages. Along the road posters commemorating dead family members are lined up, a typical custom in this region. Look at the age of the commemorated persons: some have reached a very high age! Our guesthouse is set within a beautiful garden situated on the lake and has a clean beautiful sandy beach inviting you to relax. You have time to walk along the shore or swim in the lake. Start your day with a refreshing bath in the lake. There is reputedly no bilharzia. After taking breakfast at our guest-house a one-hour drive through cocoa plantations takes us to Kumasi. With a population approaching 1.5 million the university town of Kumasi is not only the country’s second-largest city but also its cultural centre and the heart of the Ashanti Region. The namecomes from 'kum asi' and means “under the kum tree”. According to legend the priest Okomfo Anokye planted two seedlings of a kum tree at two different places of the kingdom, but only the seedling he had planted at the place of today’s Kumasi grew well, the other one did not grow at all: a good omen which laid the foundation of the town. At the end of the 17th century Kumasi became the capital of the Ashanti Kingdom, one of the most important kingdoms in West Africa. Until about 1900 when it was razed by Britain, Kumasi has been a beautiful proud town, but almost all precious evidence of its great history was destroyed. Only few objects of the kingdom’s powerful period have been preserved, most of them are displayed in the Armed Forces Museum. We begin our exploration of Kumasi at the Cultural Centre. Alongside with a popular library and curio shops a variety of craft workshops is located on the grounds of this large complex. We see painters, weavers, black-smiths, wood carvers, potters and many other artisans at work. The Prembeh II Jubilee Museum is also situated within the Cultural Centre. It houses historical treasures including the fake Golden Stool which tells us a funny story. The original Golden Stool is considered a sacred object to the Ashanti for it contains the spirit of the entire kingdom. Legend has it that priest Anokye sent it from heaven in order to ensure the kingdom’s continued existence. When the British conquered the town in 1900 they requested the Golden Stool. Outraged of this disregard for their most sacred values the Ashanti fooled the British. Instead of the original Golden Stool they handed over a replica. It took the British many decades to discover that they had been deceived! One of Kumasi’s main attractions is Manhyia Palace, the residence of the Ashanti king Nana Osei Tutu II. If you are at Kumasi on an Adae festival day we will visit this important event when the Asantehene receives homage from his subjects. On this occasion people dress in colourful traditional clothes, there is a lot of drum beating and horn blowing. This morning is free to explore the sprawling Kejetia market, one of West Africa’s largest markets. Covering an area of approximately 10 ha and housing more than 10.000 stalls it is a challenge for the first-time visitor. With every step you take into the market’s labyrinthine alleyways, passing stalls, unbelievable crowds of people and goods, you will ask yourself: how am I ever going to find my way back? The best way not to get lost is to stay close behind our guide. So you can enjoy the overwhelming market. Try fufu, Ghana’s national dish, or Nkatekwan, the delicious groundnut soup! You want to have new clothes? The Kejetia market offers the best opportunity of buying fabric, such as locally made Kente cloth. Later today we continue to our overnight stop at Techiman via Boabeng-Fiama Monkey Sanctuary. We begin to see the scenery changing: The tropical rainforest gives way to dry savannah grasslands punctuated by baobabs, mango and karité trees. Everywhere in Africa the baobab (Adansonia digitata) is considered a sacred tree. All of its parts are useful: its bark is woven into ropes and mats, its velvet-like fruit offers a vitamin-rich juice, the young leafs are commonly used as a leaf vegetable and the roots play an important role in traditional medicine. 165 km north of Kumasi lies the Boabeng-Fiama monkey sanctuary which links the two villages of Boabeng and Fiama. It is home to over 500 individuals of Campbell’s Mona and more than 200 black-and white-Colobus monkeys. In this part of Ghana they are considered sacred, so the villagers live in perfect harmony with the animals. It is illegal to harm them. Whenever one of the monkeys dies it is even buried like a human being and is given funeral service. This afternoon we take a guided walk through the forest to see the monkeys at close range. After our visit we continue to our overnight stop at Techiman. Our drive today takes us to Ghana’s largest national park. Now we are in the Brong-Ahafo-Region. After one hour we reach the Kintampo Falls. Only a few hundred meters away from the main road the Pumpu River provides several cascades. We enjoy the beautiful view of the waterfall. After another hour we cross the Black Volta. It is the tallest of the Volta’s headwaters rising in Burkina Faso. We cross the bridge over the mighty river on foot and watch the peaceful village life on the banks. Shortly after having crossed the Volta River we reach the turn-off to Mole National Park. Via the small rural town of Damongo we reach Mole, Ghana’s oldest national park, in the afternoon. 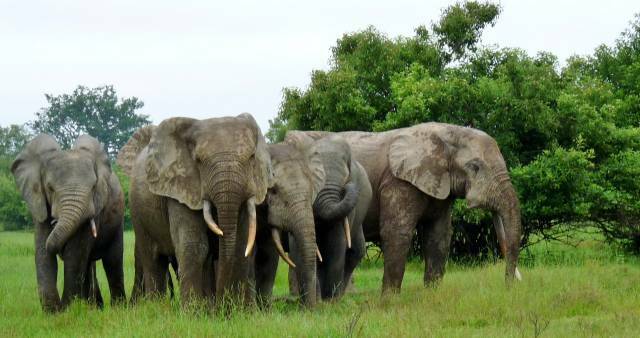 Mole National Park, situated in the north west of the country, is one of Ghana’s highlights. Covering 4840 km² it is not only Ghana’s largest wildlife sanctuary but also the biggest in West Africa. 93 mammal species have been recorded and the game-rich park promises unforgettable game drives or guided safaris on foot. Alongside with the king of animals, the lion, and other big cats there is a good chance to view elephant, buffalo or different kinds of antelope. The park is also ideal for bird lovers because more than 350 kinds of birds live here and special bird walks are offered accompanied by an ornithological guide. Different species of eagles, buzzards and vultures, but also hornbills are often sighted in Mole National Park. The landscape of the park is also very beautiful. We drive through tree savannah with impressing acacia trees, gallery forests grow on the river banks. The region in which the park is located is also of historical importance. In former times caravans used to pass through the area on their way from Wa to Salaga. It was the route of the slave raiders who transported their victims to the coast. Today we make foot safaris or game drives with National Park rangers in both the morning and afternoon in search of some of the wildlife which lives here and to observe the animals in their natural habitat. A game walk is especially amazing. Accompanied by an experienced guide we walk through the park in order to sight elephant, warthogs, baboons, kob antelope, waterbuck and many other kinds of animals. There is the opportunity to see elephants and other large animals at surprisingly close quarters. It is an indescribable feeling to stand just a few meters away from an elephant! Our attentive guide will give you detailed safety instructions so that the game walk will be a safe adventure for you. A walking safari is the most authentic and interactive way to explore the African bush! This morning we’ll have time for another game walk (optional). You also can walk to the nearby panorama terrace and enjoy the view over the peaceful savannah. But be warned! Maybe the seats on the terrace are already occupied by baboons! After breakfast we will leave the National Park heading to Wa via Larabanga, a small village with 4000 inhabitants. Situated nearby the park entrance Larabanga is famous for its mud-and-stick mosque, dating probably from the 17th century, purported to be the oldest of its kind in Ghana. The mosque is about 10m high and built in the typical west Sudanese style. A bumpy dirt road brings us to Sawla where we join the tarred road to Wa. There are only a few villages along the road. From time to time we see signs indicating that we are still driving along the Southern border of the national park. We will reach Wa in the early afternoon. Wa is the main town of the Upper West region and one of the oldest cities in Ghana and it was one of the first parts of the country to adopt the Islamic faith. Due to its favourable geographical location at the crossroads of ancient caravan routes, Wa developed from a resting place for traders to one of the most important market towns of the area and capital of the Region with the residence of the Wa-Na, the local king. After lunch we will visit the city centre and Wa’s most important buildings. The king’s palace is found near the main roundabout. It was constructed during the 19th century to imitate the architectural style of the ancient Sudanese mud mosques in town. In front of the palace complex we find the graves of the former rulers. Only a few hundred meters to the northeast we’ll see the modern Great Mosque and next to it an old but well-preserved one in the West- Sudanese-style. In Wa we have the opportunity to spend our last cedis because tomorrow we will leave Ghana crossing into Burkina Faso. This morning we continue our journey on a dirt road crossing the border into Burkina Faso at Hamile. After customs and immigration procedures we head west on a good gravel road. Near the border we cross the River Mouhoun, as the Black Volta is called in Burkina Faso. The country was named Upper Volta by the French after its three major rivers, the Black, White and Red Volta.The Republic of Upper Volta has since changed its name to Burkina Faso. It was renamed in 1984 by President Thomas Sankara to mean "the land of upright people" in Mòoré. A name that suits the population, because people are helpful, friendly and open minded. We reach the land of the Lobi and spend some time with a local guide, making the most of the opportunity to learn a little something about this ethnic group. The Lobi make up about 7% of Burkina’s population, they are also found in the North west of Ghana and Ivory Coast. In Burkina Faso we find their settlements around the town of Gaoua. Here we visit a typical village and become acquainted with the Lobi’s traditions. They still adhere to many of their traditional customs and animist practices, worshipping wooden fetishes and continuing to hold fast to their age-old beliefs. Their large mud houses, known as soukala, are similar to miniature fortresses, an architectural style they once developed to defend themselves against attacks from their enemies and wild animals. Their compounds are constructed well away from each other, which is another protective measure. In the past the Lobi were traditionally hunters and fishermen, nowadays they are farming and raising livestock. Our destination today is the city of Bobo- Dioulasso, Burkina’s second largest town, which we will reach in the afternoon. We stay for the night in the beautiful hotel L’Auberge. In the evening we enjoy live music in one of the numerous open-air cafés or bars. Today we visit Burkina’s second largest town, which was founded in the 15th century when the first people settled in the area. It was then called Sya. Bobo Dioulasso means “house of the Bobo and Dioula”, after the two tribes living in the area. Today Bobo, as it is affectionately called by its inhabitants, is the country’s most important commercial centre and capital of music. We start our tour with the visit of the magnificent Great Mosque, built at the end of the 19th century by the religious leader Almamy Sidiki Sanou. It is Burkina’s largest mosque and may be visited by non-Muslims if accompanied by a guide. The mosque can accommodate hundreds of worshippers.Climbing upone of the “sugarloaf” minarets we reach the top of the mosque to see the clever ventilation system consisting of many holes in the roof which in the dry season provide light and fresh air and during the rainy season are covered with individual little clay caps to prevent the rain getting in. Across the road from the mosque, we enter the old town, known as Dioulassoba. It has four quarters, an animist and a Muslim one, as well as the quarter of the griots and the one of the blacksmiths. During our walk through the old town we’ll see fetishes of the animists, we’ll be introduced to the art of brewing millet beer, discover the sacred catfish in the Houet river and meet the town’s blacksmiths and bronze artists. The bronze workers have different roles, including artists who shape the initial model out of wax, mould-makers who create a cast of the wax image and bronziers, who melt the metal and cast the object. Finally, workers smooth and shine the finish on each item. Leaving the old town we continue our visit in the modern city of Bobo Dioulasso Its centrepiece is the vibrant Grand Marché which burnt down in 1998 and was rebuilt in 2001 in neo-Sudanese style. We’ll have a stroll through the bustling market hall with its fruit and vegetable stalls, meat and fish sections. In another part of the huge market household wares and colourful fabrics are sold. As the market cannot accommodate all vendors, it spills over onto the surrounding streets. There are also curio shops for tourists with souvenirs on sale. It offers a good opportunity to buy masks, sculptures, bronze or jewellery. Pottery you’d better buy on the pottery market close to the old town. Next to the market, we’ll visit Bobo’s impressive cathedral and from there we’ll reach the extravagant train station. During colonial times the French had planned to connect Abidjan with Niamey, a vision they could never put into practice. Due to the beginning of World War II and increasing costs they had to abandon their project. so the railway could built it to Ouagadougou. Trains from Bobo to Ouagadougou are still running today. The station was built in 1934 in colonial architectural style. Later this afternoon you will have free time to explore more of Bobo Dioulasso. After breakfast we drive on a tarred road to Ouagadougou, Burkina’s capital, which we reach before lunch. After a short break we continue our journey to the small town of Manega, located about 50 km north of Ouagadougou where we visit the interesting Museum de la bendrologie. The museum was established by the author and solicitor Titinga Frédéric Pacéré who had amassed an impressive collection of century-old masks, musical instruments and clothes of Burkina Faso’s various ethnical groups. About 60 Yakouga tombstones are displayed in the so-called Younyonsé pavilion bearing witness to a thousand-year-old culture. The courtyard contains traditional dwellings of the Mossi and Bobo tribes. There are also sculptures of modern Burkinabe artists on the premises. This morning we take a tour to Tiébélé which is the best place to see well-preserved Kassena houses. A three-hour drive brings us to the small town east of Pô with a population of approximately 18000. Passing villages contain the first hint of the magnificent architecture to come. We start our visit at the Royal Court, the chief’s compound where more than 400 family members live. The houses are decorated with a repetition of geometric signs. They are circular, square ore figure-eight-shaped depending on the status of the occupants. Round huts are for bachelors, rectangular houses for newly married couples and the figure-eight-shaped dwellings are for grandparents and grandchildren, with connecting circular chambers. The hut-painting is done by women. Every year, at the beginning of the dry season they renew the expressive decoration. The black colour is made of a mix of pounded graphite and volcanic rock and the white colour of soapstone and calcium. The red paint comes from kaolin. The wall coating is made from earth, cow dung and ash. They apply the geometric patterns onto a final base layer which contains pounded laterite, water and boiled seeds of the nere tree using brushes fashioned from the feathers of guinea fowl. Each pattern represents a symbol, the most popular symbol is the calabash which is extremely important in a Kassena woman’s life. It is used as a drinking goblet, paint-pot and receptacle for sacrifices and retains its importance beyond death. By tradition, a calabash will be broken on the fourth day after a woman dies. We explore the village accompanied by a local guide who will also show us the interior of the houses. Be ready for a special experience! The houses are secured by a clever system. The entrances are very low and they are blocked by interior walls. So we need to climb over the wall in a squatting position. What is a funny gymnastic exercise for us, serves as a safety mechanism for the inhabitants to defend themselves against enemies. Towards evening we return to Ouagadougou. This morning we will head into Ouagadougou for some sightseeing. Ouagadougou was founded in the 11th century by the Yonyonsé who named the settlement Kombemtinga, which means „town of warriors“. It was conquered in the 15th century by the Mossi and became capital of the Mossi Empire. In 1681 the first Mossi emperor, Moro Naba, was crowned and the town was renamed Wogdgo, which means “come and pay tribute”. It was the permanent residence of the Mossi rulers and over the time became Wagadugu. Ouagadougou is the French name for it. The modern capital with a population of about 1.5 million, does not offer many architectural marvels, but it is rich in gardens, parks and outdoor-bars. The inhabitants proudly present their town as Africa’s art capital. Indeed, there are festivals throughout the year including the largest film festival in Africa, the Panafrican Film and Television Festival of Ouagadougou (FESPACO) and many art exhibitions. After breakfast we take a city tour to explore Ouagadougou’s sightseeing marvels. We visit the distinctive red-brick building of the Cathedral of the Immaculate Conception built in 1934. It has served as the centre of the Christian community ever since. From here we continue to the “Village Artisanal de Ouagadougou”. More than 300 artist exhibit at this arts and crafts centre and the quality of work is outstanding. You can see the artists at work and visit their workshops. Textiles, jewellery, leatherware, wooden sculptures, musical instruments and a lot of other handicraft are on sale. It is a non-stressful, hassle-free shopping. But don’t forget to negociate! In the afternoon we return to our hotel. You can use two day rooms and relax at our hotel until the transfer to the airport. Our tour ends this evening.